In striking contrast to the detestable tragedy that unfolded, the city of Parkland joined hearts and minds to hold vigils as South Florida and the nation at large mourn alongside in remembrance of victims. For the 17 lives lost in the massacre on Wednesday, hundreds gathered at the City of Parkland Amphitheater on Thursday. 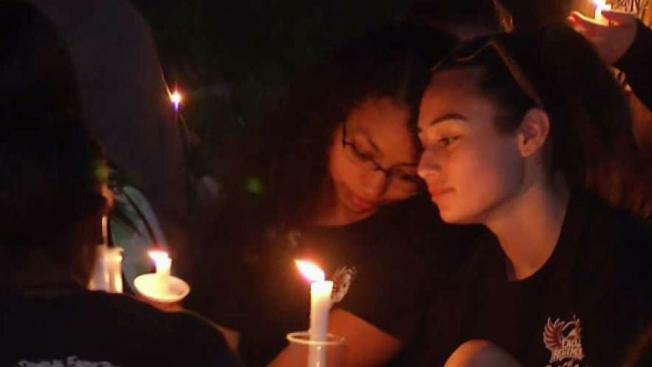 While dozens of students affected by the shooting struggle to cope with the reality of what transpired, their surrounding community is offering deep-seated support. “Emotionally, spiritually they’re struggling as they lost loved ones and friends so this is gonna be a tough road as we move forward," Parkridge Church pastor Eddie Bevill, whose church held a vigil earlier in the day, said. Earlier on Thursday, students gathered at Parkland's Pine Trails Park to hold a separate moment of silence. An official candlelight vigil event began at the Amphitheater at 6 p.m. Standing at center stage, 17 angels: four-foot tall ornamental angels adorned with lights that represent the innocent lives violently ended. But before the angels stood in Parkland, those symbols stood among others in the city of Sunrise where they represented victims of the Sandy Hook Elementary School shooting. On Dec. 14, 2012, 26 lives were tragically taken at the Connecticut elementary school by a gunman who also died. 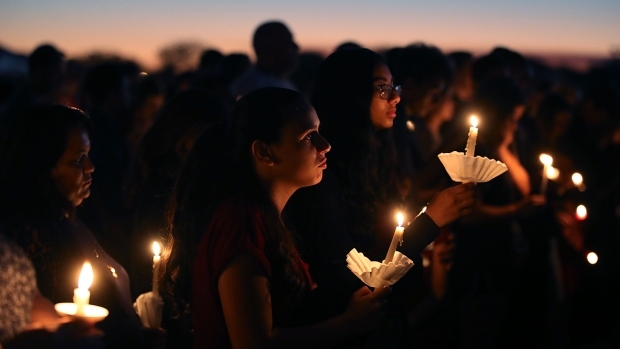 The Parkland school tragedy joins an undesired podium position as one of the worst school shootings in U.S. history – third behind Sandy Hook and the Virginia Tech massacre, in which 32 died. Sunrise placed the angels on the first anniversary of the Sandy Hook shooting. Seventeen lives lost. Dozens upon dozens of others possibly scarred. In the coming days, heartwrenching details will continue to surface and bewildering questions will arise – all as mourning families steadily put their lost loved ones to rest. For the time being, a community – families, survivors and neighbors – stand in solidarity as the positive reflection of a forced juxtaposition derived from despair.